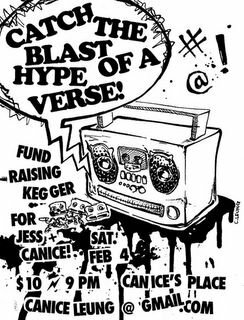 Premature Nostalgia: Kegger for a Cause! "my friend jessica and i are holding a kegger to raise funds for the summer. she needs $6000 by june so she can go to vanuatu (the pacific) on a community development project. * i'm heading to new york city to parsons institute of art and design to study photography and need almost $3000 (it's also my birthday). donations are more than welcome. please tell your friends!" When was the last time you went to a kegger thrown by two girls? *I try to avoid writing too much about my personal life, apart from where drinking and beards are involved. However, if anyone is interested in hearing about this, I'd be more than happy to share.